I purchased some iPhone cases for gifts and thought I’d share photos of them with y’all, especially since there’s a sale on. Of all of the photographic stuff I have, none of that stuff includes a copy stand, so these photos were taken with my Lumia Icon phone (more on that someday). They’re not anywhere close to perfect – but they do give you an idea of what could be wrapped around your iPhone (or Galaxy S4 or iPad). They also make great gifts! BNSF Pasadena Subdivision Local Freight. Glendora, CA. This was taken in 2013 – Santa Fe merged into BNSF almost 20 years ago! 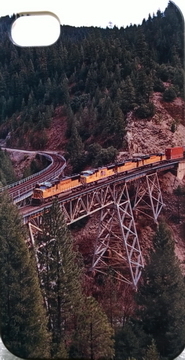 Union Pacific westbound doublestack train on the former Western Pacific Railroad crossing the famous Keddie Wye in Plumas County, CA. This one is not yet in the galleries. The view across Kauai’s Nawiliwili Harbor. Cape Neddick Light (a.k.a. Nubble Light) in York, ME. And yes, if you are wondering, I did get wet just after I clicked the shutter. If you’ve found that image that you’ve been wanting, and have needed an excuse to buy it, now you have it (at least if we have a case for it)! There’s a video on the Laughing Frog Images YouTube Channel that shows you how to create your own case, or how to create a gift for someone who deserves something special. Or, just think of the smile you can bring to someone’s face when they unwrap their case.